Scottish Jazz Awards finalists Rose Room have become one of Scotland’s leading ensembles influenced by the Gypsy Jazz genre. Sharing a love of Swing music and the style of the great Django Reinhardt and Stephane Grappelli, their “vigorous and vivacious” performances go “down a storm” with any audience as they serve up their 1930s ‘Hot Club’ standards, Gypsy Jazz favourites and self-penned originals with virtuosity, verve and panache recreating the excitement of Rive Gauche Paris. Based in Glasgow, the quartet features award-winning violinist and “sophisticated songstress” Seonaid Aitken (who also plays with the Orchestra of Scottish Opera, arranges/orchestrates for theatre, film and television including the BBC/Richard Curtis/Roald Dahl film ‘Esio Trot’, and is now a guest presenter on BBC Radio Scotland’s ‘The Jazz House’), Scotland’s No.1 guitar maker Jimmy Moon on double bass, and Danny Kyle Award-winners Swing Guitars’ Tam Gallagher and Tom Watson on rhythm and solo guitars respectively. Roseland’ (2011) – Rose Room were delighted to have been nominated for ‘Ensemble of the Year’ in the last ‘Scottish Jazz Awards’ and are frequently played on BBC Radio Scotland’s ‘The Jazz House’ and Jazz FM. 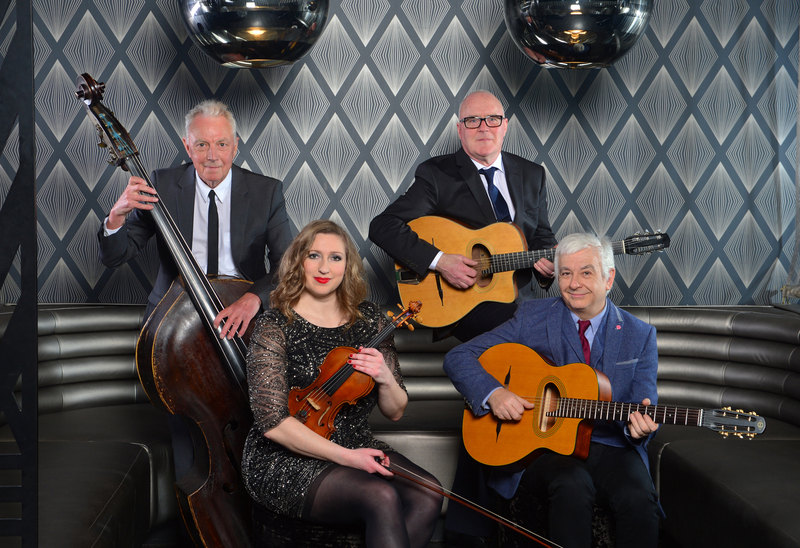 They have performed with world-famous virtuoso guitarist Martin Taylor, German Gypsy Jazz star Joscho Stephan and they are involved in teaching and fundraising for The Clutha Trust charity. Two of Rose Room’s tracks are also featured on The Clutha Sessions charity CD. Please note there is no bar at this event so please bring your own.